For other uses, see Lettuce (disambiguation). Lettuce (Lactuca sativa) is an annual plant of the daisy family, Asteraceae. It is most often grown as a leaf vegetable, but sometimes for its stem and seeds. Lettuce is most often used for salads, although it is also seen in other kinds of food, such as soups, sandwiches and wraps; it can also be grilled. One variety, the woju (莴苣), or asparagus lettuce (celtuce), is grown for its stems, which are eaten either raw or cooked. In addition to its main use as a leafy green, it has also gathered religious and medicinal significance over centuries of human consumption. Europe and North America originally dominated the market for lettuce, but by the late 20th century the consumption of lettuce had spread throughout the world. World production of lettuce and chicory for calendar year 2015 was 26.1 million tonnes, 56% of which came from China. Lettuce was first cultivated by the ancient Egyptians who turned it from a weed whose seeds were used to produce oil, into a food plant grown for its succulent leaves and oil-rich seeds. Lettuce spread to the Greeks and Romans, the latter of whom gave it the name lactuca, from which the English lettuce is ultimately derived. By 50 AD, many types were described, and lettuce appeared often in medieval writings, including several herbals. The 16th through 18th centuries saw the development of many varieties in Europe, and by the mid-18th century cultivars were described that can still be found in gardens. Generally grown as a hardy annual, lettuce is easily cultivated, although it requires relatively low temperatures to prevent it from flowering quickly. It can be plagued by numerous nutrient deficiencies, as well as insect and mammal pests, and fungal and bacterial diseases. L. sativa crosses easily within the species and with some other species within the genus Lactuca. Although this trait can be a problem to home gardeners who attempt to save seeds, biologists have used it to broaden the gene pool of cultivated lettuce varieties. Lettuce is a rich source of vitamin K and vitamin A, and a moderate source of folate and iron. Contaminated lettuce is often a source of bacterial, viral, and parasitic outbreaks in humans, including E. coli and Salmonella. Lactuca sativa is a member of the Lactuca (lettuce) genus and the Asteraceae (sunflower or aster) family. The species was first described in 1753 by Carl Linnaeus in the second volume of his Species Plantarum. Synonyms for L. sativa include Lactuca scariola var. sativa, L. scariola var. integrata and L. scariola var. integrifolia. L. scariola is itself a synonym for L. serriola, the common wild or prickly lettuce. L. sativa also has many identified taxonomic groups, subspecies and varieties, which delineate the various cultivar groups of domesticated lettuce. Lettuce is closely related to several Lactuca species from southwest Asia; the closest relationship is to L. serriola, an aggressive weed common in temperate and subtropical zones in much of the world. The Romans referred to lettuce as lactuca (lac meaning milk in Latin), an allusion to the white substance, now called latex, exuded by cut stems. This word has become the genus name, while sativa (meaning "sown" or "cultivated") was added to create the species name. The current word lettuce, originally from Middle English, came from the Old French letues or laitues, which derived from the Roman name. The name romaine came from that type's use in the Roman papal gardens, while cos, another term for romaine lettuce, came from the earliest European seeds of the type from the Greek island of Cos, a center of lettuce farming in the Byzantine period. Lettuce's native range spreads from the Mediterranean to Siberia, although it has been transported to almost all areas of the world. Plants generally have a height and spread of 15 to 30 cm (6 to 12 in). The leaves are colorful, mainly in the green and red color spectrums, with some variegated varieties. There are also a few varieties with yellow, gold or blue-teal leaves. Lettuces have a wide range of shapes and textures, from the dense heads of the iceberg type to the notched, scalloped, frilly or ruffly leaves of leaf varieties. Lettuce plants have a root system that includes a main taproot and smaller secondary roots. Some varieties, especially those found in the United States and Western Europe, have long, narrow taproots and a small set of secondary roots. Longer taproots and more extensive secondary systems are found in varieties from Asia. Depending on the variety and time of year, lettuce generally lives 65–130 days from planting to harvesting. Because lettuce that flowers (through the process known as "bolting") becomes bitter and unsaleable, plants grown for consumption are rarely allowed to grow to maturity. Lettuce flowers more quickly in hot temperatures, while freezing temperatures cause slower growth and sometimes damage to outer leaves. Once plants move past the edible stage, they develop flower stalks up to 1 m (3 ft 3 in) high with small yellow blossoms. Like other members of the tribe Cichorieae, lettuce inflorescences (also known as flower heads or capitula) are composed of multiple florets, each with a modified calyx called a pappus (which becomes the feathery "parachute" of the fruit), a corolla of five petals fused into a ligule or strap, and the reproductive parts. These include fused anthers that form a tube which surrounds a style and bipartite stigma. As the anthers shed pollen, the style elongates to allow the stigmas, now coated with pollen, to emerge from the tube. The ovaries form compressed, obovate (teardrop-shaped) dry fruits that do not open at maturity, measuring 3 to 4 mm long. The fruits have 5–7 ribs on each side and are tipped by two rows of small white hairs. 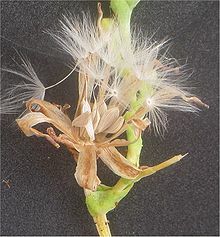 The pappus remains at the top of each fruit as a dispersal structure. Each fruit contains one seed, which can be white, yellow, gray or brown depending on the variety of lettuce. The domestication of lettuce over the centuries has resulted in several changes through selective breeding: delayed bolting, larger seeds, larger leaves and heads, better taste and texture, a lower latex content, and different leaf shapes and colors. Work in these areas continues through the present day. Scientific research into the genetic modification of lettuce is ongoing, with over 85 field trials taking place between 1992 and 2005 in the European Union and United States to test modifications allowing greater herbicide tolerance, greater resistance to insects and fungi and slower bolting patterns. However, genetically modified lettuce is not currently used in commercial agriculture. Lettuce was first cultivated in ancient Egypt for the production of oil from its seeds. This plant was probably selectively bred by the Egyptians into a plant grown for its edible leaves, with evidence of its cultivation appearing as early as 2680 BC. Lettuce was considered a sacred plant of the reproduction god Min, and it was carried during his festivals and placed near his images. The plant was thought to help the god "perform the sexual act untiringly." Its use in religious ceremonies resulted in the creation of many images in tombs and wall paintings. The cultivated variety appears to have been about 75 cm (30 in) tall and resembled a large version of the modern romaine lettuce. These upright lettuces were developed by the Egyptians and passed to the Greeks, who in turn shared them with the Romans. Circa 50 AD, Roman agriculturalist Columella described several lettuce varieties – some of which may have been ancestors of today's lettuces. Lettuce appears in many medieval writings, especially as a medicinal herb. Hildegard of Bingen mentioned it in her writings on medicinal herbs between 1098 and 1179, and many early herbals also describe its uses. In 1586, Joachim Camerarius provided descriptions of the three basic modern lettuces – head lettuce, loose-leaf lettuce, and romaine (or cos) lettuce. Lettuce was first brought to the Americas from Europe by Christopher Columbus in the late 15th century. Between the late 16th century and the early 18th century, many varieties were developed in Europe, particularly Holland. Books published in the mid-18th and early 19th centuries describe several varieties found in gardens today. Due to its short lifespan after harvest, lettuce was originally sold relatively close to where it was grown. The early 20th century saw the development of new packing, storage and shipping technologies that improved the lifespan and transportability of lettuce and resulted in a significant increase in availability. During the 1950s, lettuce production was revolutionized with the development of vacuum cooling, which allowed field cooling and packing of lettuce, replacing the previously used method of ice-cooling in packing houses outside the fields. Lettuce is very easy to grow, and as such has been a significant source of sales for many seed companies. Tracing the history of many varieties is complicated by the practice of many companies, particularly in the US, of changing a variety's name from year to year. This was done for several reasons, the most prominent being to boost sales by promoting a "new" variety or to prevent customers from knowing that the variety had been developed by a competing seed company. Documentation from the late 19th century shows between 65 and 140 distinct varieties of lettuce, depending on the amount of variation allowed between types – a distinct difference from the 1,100 named lettuce varieties on the market at the time. Names also often changed significantly from country to country. Although most lettuce grown today is used as a vegetable, a minor amount is used in the production of tobacco-free cigarettes; however, domestic lettuce's wild relatives produce a leaf that visually more closely resembles tobacco. 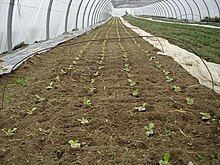 A hardy annual, some varieties of lettuce can be overwintered even in relatively cold climates under a layer of straw, and older, heirloom varieties are often grown in cold frames. Lettuces meant for the cutting of individual leaves are generally planted straight into the garden in thick rows. Heading varieties of lettuces are commonly started in flats, then transplanted to individual spots, usually 20 to 36 cm (7.9 to 14.2 in) apart, in the garden after developing several leaves. Lettuce spaced further apart receives more sunlight, which improves color and nutrient quantities in the leaves. Pale to white lettuce, such as the centers in some iceberg lettuce, contain few nutrients. Lettuce grows best in full sun in loose, nitrogen-rich soils with a pH of between 6.0 and 6.8. Heat generally prompts lettuce to bolt, with most varieties growing poorly above 24 °C (75 °F); cool temperatures prompt better performance, with 16 to 18 °C (61 to 64 °F) being preferred and as low as 7 °C (45 °F) being tolerated. Plants in hot areas that are provided partial shade during the hottest part of the day will bolt more slowly. Temperatures above 27 °C (81 °F) will generally result in poor or non-existent germination of lettuce seeds. After harvest, lettuce lasts the longest when kept at 0 °C (32 °F) and 96 percent humidity. Lettuce quickly degrades when stored with fruit such as apples, pears and bananas that release the ripening agent ethylene gas. The high water content of lettuce (94.9 percent) creates problems when attempting to preserve the plant – it cannot be successfully frozen, canned or dried and must be eaten fresh. Lettuce varieties will cross with each other, making spacing of 1.5 to 6 m (60 to 240 in) between varieties necessary to prevent contamination when saving seeds. Lettuce will also cross with Lactuca serriola (wild lettuce), with the resulting seeds often producing a plant with tough, bitter leaves. 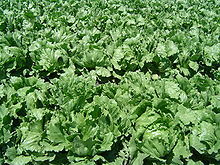 Celtuce, a lettuce variety grown primarily in Asia for its stems, crosses easily with lettuces grown for their leaves. This propensity for crossing, however, has led to breeding programs using closely related species in Lactuca, such as L. serriola, L. saligna, and L. virosa, to broaden the available gene pool. Starting in the 1990s, such programs began to include more distantly related species such as L. tatarica. Seeds keep best when stored in cool conditions, and, unless stored cryogenically, remain viable the longest when stored at −20 °C (−4 °F); they are relatively short lived in storage. At room temperature, lettuce seeds remain viable for only a few months. However, when newly harvested lettuce seed is stored cryogenically, this life increases to a half-life of 500 years for vaporized nitrogen and 3,400 years for liquid nitrogen; this advantage is lost if seeds are not frozen promptly after harvesting. Romaine/Cos – Used mainly for salads and sandwiches, this type forms long, upright heads. This is the most often used lettuce in Caesar salads. Iceberg/Crisphead – The most popular type in the United States, it is very heat-sensitive and was originally adapted for growth in the northern United States. It ships well, but is low in flavor and nutritional content, being composed of even more water than other lettuce types. Butterhead – Also known as Boston or Bibb lettuce, and traditional in the UK as "round lettuce", this type is a head lettuce with a loose arrangement of leaves, known for its sweet flavor and tender texture. Celtuce/Stem – This type is grown for its seedstalk, rather than its leaves, and is used in Asian cooking, primarily Chinese, as well as stewed and creamed dishes. Oilseed – This type is grown for its seeds, which are pressed to extract an oil mainly used for cooking. It has few leaves, bolts quickly and produces seeds around 50 percent larger than other types of lettuce. The butterhead and crisphead types are sometimes known together as "cabbage" lettuce, because their heads are shorter, flatter, and more cabbage-like than romaine lettuces. Soil nutrient deficiencies can cause a variety of plant problems that range from malformed plants to a lack of head growth. Many insects are attracted to lettuce, including cutworms, which cut seedlings off at the soil line; wireworms and nematodes, which cause yellow, stunted plants; tarnished plant bugs and aphids, which cause yellow, distorted leaves; leafhoppers, which cause stunted growth and pale leaves; thrips, which turn leaves gray-green or silver; leafminers, which create tunnels within the leaves; flea beetles, which cut small holes in leaves and caterpillars, slugs and snails, which cut large holes in leaves. For example, the larvae of the ghost moth is a common pest of lettuce plants. Mammals, including rabbits and groundhogs, also eat the plants. Lettuce contains several defensive compounds, including sesquiterpene lactones, and other natural phenolics such as flavonol and glycosides, which help to protect it against pests. Certain varieties contain more than others, and some selective breeding and genetic modification studies have focused on using this trait to identify and produce commercial varieties with increased pest resistance. Lettuce also suffers from several viral diseases, including big vein, which causes yellow, distorted leaves, and mosaic virus, which is spread by aphids and causes stunted plant growth and deformed leaves. Aster yellows are a disease-causing bacteria carried by leafhoppers, which causes deformed leaves. Fungal diseases include powdery mildew and downy mildew, which cause leaves to mold and die and bottom rot, lettuce drop and gray mold, which cause entire plants to rot and collapse. Crowding lettuce tends to attract pests and diseases. Weeds can also be an issue, as cultivated lettuce is generally not competitive with them, especially when directly seeded into the ground. Transplanted lettuce (started in flats and later moved to growing beds) is generally more competitive initially, but can still be crowded later in the season, causing misshapen lettuce and lower yields. Weeds also act as homes for insects and disease and can make harvesting more difficult. 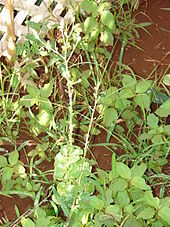 Herbicides are often used to control weeds in commercial production. However, this has led to the development of herbicide-resistant weeds and prompted environmental and health concerns. In 2015, world production of lettuce (report combined with chicory) was 26.1 million tonnes, with China alone producing 14.6 million tonnes or 56% of the world total (table). Lettuce is the only member of the genus Lactuca to be grown commercially. Although China is the top world producer of lettuce, the majority of the crop is consumed domestically. Spain is the world's largest exporter of lettuce, with the US ranking second. Western Europe and North America were the original major markets for large-scale lettuce production. By the late 1900s, Asia, South America, Australia and Africa became more substantial markets. Different locations tended to prefer different types of lettuce, with butterhead prevailing in northern Europe and Great Britain, romaine in the Mediterranean and stem lettuce in China and Egypt. By the late 20th century, the preferred types began to change, with crisphead, especially iceberg, lettuce becoming the dominant type in northern Europe and Great Britain and more popular in western Europe. In the US, no one type predominated until the early 20th century, when crisphead lettuces began gaining popularity. After the 1940s, with the development of iceberg lettuce, 95 percent of the lettuce grown and consumed in the US was crisphead lettuce. By the end of the century, other types began to regain popularity and eventually made up over 30 percent of production. Stem lettuce was first developed in China, and remains primarily cultivated in that country. In the early 21st century, bagged salad products increased in the lettuce market, especially in the US where innovative packaging and shipping methods prolonged freshness. In the United States in 2013, California (71%) and Arizona (29%) produced nearly all of the country's fresh head and leaf lettuce, with head lettuce yielding $9400 of value per acre and leaf lettuce $8000 per acre. As described around 50 AD, lettuce leaves were often cooked and served by the Romans with an oil-and-vinegar dressing; however, smaller leaves were sometimes eaten raw. During the 81–96 AD reign of Domitian, the tradition of serving a lettuce salad before a meal began. Post-Roman Europe continued the tradition of poaching lettuce, mainly with large romaine types, as well as the method of pouring a hot oil and vinegar mixture over the leaves. Today, the majority of lettuce is grown for its leaves, although one type is grown for its stem and one for its seeds, which are made into an oil. Most lettuce is used in salads, either alone or with other greens, vegetables, meats and cheeses. Romaine lettuce is often used for Caesar salads, with a dressing that includes anchovies and eggs. Lettuce leaves can also be found in soups, sandwiches and wraps, while the stems are eaten both raw and cooked. The consumption of lettuce in China developed differently from in Western countries, due to health risks and cultural aversion to eating raw leaves. In that country, "salads" were created from cooked vegetables and served hot or cold. Lettuce was also used in a larger variety of dishes than in Western countries, contributing to a range of dishes including bean curd and meat dishes, soups and stir-frys plain or with other vegetables. Stem lettuce, widely consumed in China, is eaten either raw or cooked, the latter primarily in soups and stir-frys. Lettuce is also used as a primary ingredient in the preparation of lettuce soup. Depending on the variety, lettuce is an excellent source (20% of the Daily Value, DV, or higher) of vitamin K (97% DV) and vitamin A (21% DV) (table), with higher concentrations of the provitamin A compound, beta-carotene, found in darker green lettuces, such as Romaine. With the exception of the iceberg variety, lettuce is also a good source (10-19% DV) of folate and iron (table). Food-borne pathogens that can survive on lettuce include Listeria monocytogenes, the causative agent of listeriosis, which multiplies in storage. However, despite high levels of bacteria being found on ready-to-eat lettuce products, a 2008 study found no incidences of food-borne illness related to listeriosis, possibly due to the product's short shelf life, indigenous microflora competing with the Listeria bacteria or inhibition of bacteria to cause listeriosis. Other bacteria found on lettuce include Aeromonas species, which have not been linked to any outbreaks; Campylobacter species, which cause campylobacteriosis; and Yersinia intermedia and Yersinia kristensenii (species of Yersinia), which have been found mainly in lettuce. Lettuce has been linked to numerous outbreaks of the bacteria E. coli O157:H7 and Shigella; the plants were most likely contaminated through contact with animal feces. A 2007 study determined that the vacuum cooling method, especially prevalent in the California lettuce industry, increased the uptake and survival rates of E. coli O157:H7. Salmonella bacteria, including the uncommon Salmonella braenderup type, have also caused outbreaks traced to contaminated lettuce. Viruses, including hepatitis A, calicivirus and a Norwalk-like strain, have been found in lettuce. The vegetable has also been linked to outbreaks of parasitic infestations, including Giardia lamblia. In addition to its usual purpose as an edible leafy vegetable, lettuce has had a number of uses in ancient (and even some more modern) times as a medicinal herb and religious symbol. For example, ancient Egyptians thought lettuce to be a symbol of sexual prowess and a promoter of love and childbearing in women. The Romans likewise claimed that it increased sexual potency. In contrast, the ancient Greeks connected the plant with male impotency, and served it during funerals (probably due to its role in the myth of Adonis' death), and British women in the 19th century believed it would cause infertility and sterility. Lettuce has mild narcotic properties; it was called "sleepwort" by the Anglo-Saxons because of this attribute, although the cultivated L. sativa has lower levels of the narcotic than its wild cousins. This narcotic effect is a property of two sesquiterpene lactones which are found in the white liquid (latex) in the stems of lettuce, called lactucarium or "lettuce opium". 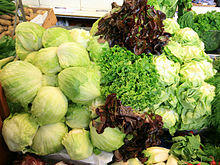 Lettuce is also eaten as part of the Jewish Passover Seder, where it is considered the optimal choice for use as the bitter herb, which is eaten together with the matzah. Some American settlers claimed that smallpox could be prevented through the ingestion of lettuce, and an Iranian belief suggested consumption of the seeds when afflicted with typhoid. Folk medicine has also claimed it as a treatment for pain, rheumatism, tension and nervousness, coughs and insanity; scientific evidence of these benefits in humans has not been found. The religious ties of lettuce continue into the present day among the Yazidi people of northern Iraq, who have a religious prohibition against eating the plant. ^ a b c d "Lactuca sativa". Kew Royal Botanical Gardens. Archived from the original on 2 November 2012. Retrieved 2 April 2012. ^ a b "Lactuca serriola L". United States Department of Agriculture. Retrieved 2 April 2012. ^ Hugh Fearnley-Whittingstall. "Grilled lettuce with goats' cheese". BBC. Retrieved 17 May 2013. ^ a b "Lettuce (with chicory) production in 2015; Countries/Regions/Production Quantity from pick lists". UN Food & Agriculture Organization, Statistics Division (FAOSTAT). 2015. Retrieved 31 December 2017. ^ "Lactuca sativa L". Integrated Taxonomic Information System. Retrieved 27 March 2010. ^ "The Linnaean Plant Name Typification Project". Natural History Museum. Retrieved 17 December 2015. ^ "Lactuca sativa L". United States Department of Agriculture. Retrieved 2 April 2012. ^ Porcher, Michael H. (2005). "Sorting Lactuca Names". Multilingual Multiscript Plant Name Database. University of Melbourne. Archived from the original on 16 September 2012. Retrieved 2 April 2012. ^ Zohary, Daniel; Hopf, Maria; Weiss, Ehud (2012). Domestication of Plants in the Old World: The Origin and Spread of Domesticated Plants in Southwest Asia, Europe, and the Mediterranean Basin. Oxford University Press. ISBN 0-19-954906-0. ^ a b c d e Weaver, pp. 170–172. ^ a b Katz and Weaver, p. 376. ^ Chantrell, Glynnis, ed. (2002). The Oxford Dictionary of Word Histories. Oxford University Press. p. 300. ISBN 0-19-863121-9. ^ a b Weaver, p. 172. ^ "Lactuca sativa". Missouri Botanical Garden. Retrieved 27 March 2012. ^ a b Fine Cooking Magazine (2011). Fine Cooking in Season: Your Guide to Choosing and Preparing the Season's Best. Taunton Press. p. 28. ISBN 1-60085-303-X. ^ a b c Ryder, J.; Waycott, Williams (1993). "New Directions in Salad Crops: New Forms, New Tools, and Old Philosophy". In Janick, J and Simon J.E (ed.). New Crops. Wiley. pp. 528–532. ^ Smith, Richard; Cahn, Michael; Daugovish, Oleg; Koike, Steven; Natwick, Eric; Smith, Hugh; Subbarao, Krishna; Takele, Etaferahu; Turin, Thomas. "Leaf Lettuce Production in California" (PDF). University of California Vegetable Research and Information Center. Retrieved 11 April 2012. ^ a b c d Weaver, pp. 175–176. ^ Barkley, Theodore M.; Brouillet, Luc; Strother, John L. "Asteraceae tribe Cichorieae". In Flora of North America Editorial Committee (ed.). Flora of North America North of Mexico (FNA). 19, 20 and 21. New York and Oxford. Retrieved 24 September 2012 – via eFloras.org, Missouri Botanical Garden, St. Louis, MO & Harvard University Herbaria, Cambridge, MA. ^ a b Davey, et al., pp. 222–225. ^ "Lettuce". GMO Compass. Archived from the original on 11 May 2012. Retrieved 3 April 2012. ^ a b Katz and Weaver, pp. 375–376. ^ Hart, George (2005). The Routledge Dictionary of Egyptian Gods and Goddesses (2nd ed.). Routledge. p. 95. ISBN 1-134-28424-1. ^ a b "Vegetable of the Month: Lettuce". Centers for Disease Control and Prevention. Archived from the original on 22 March 2012. Retrieved 26 March 2012. ^ Subbarao, Krishna V.; Koike, Steven T. (2007). "Lettuce Diseases: Ecology and Control". In Pimentel, David (ed.). Encyclopedia of Pest Management, Volume 2. CRC Press. p. 313. ISBN 1-4200-5361-2. ^ a b Weaver, pp. 172–173. ^ a b Boriss, Hayley; Brunke, Henrich (October 2005). "Commodity Profile: Lettuce" (PDF). University of California. Archived from the original (PDF) on 7 July 2012. Retrieved 1 July 2012. ^ Enochian, R.V. ; Smith, F.J (November 1956). "House Packing Western Lettuce" (PDF). California Agriculture. Archived from the original (PDF) on 15 June 2013. ^ a b Katz and Weaver, p. 377. ^ a b c d Bradley, p. 129. ^ a b c d e f g h "Lettuce". University of Illinois Extension. Retrieved 25 March 2012. ^ Davey, et al., p. 241. ^ a b c Miles, Carol. "Winter Lettuce". Washington State University. Retrieved 26 March 2012. ^ "Lettuce". Tesco Real Food. Tesco. Retrieved 16 January 2017. ^ Katz and Weaver, p. 375. ^ Edwards, C. A. (May 1964). "The bionomics of swift moths. I.—The ghost swift moth, Hepialus humuli (L.)". Bulletin of Entomological Research. 55 (1): 147–160. doi:10.1017/S000748530004935X. ISSN 1475-2670. ^ a b Bradley, pp. 129–132. ^ "Developing Multi-Species Insect Resistance in Romaine Lettuce". United States Department of Agriculture. Retrieved 5 April 2012. ^ "Lettuce: Integrated Weed Management". UC Pest Management Guidelines. University of California. August 2007. Retrieved 3 April 2012. ^ Koike, Steven T; Gladders, Peter; Paulus, Albert O. (2006). Vegetable Diseases: A Color Handbook. Gulf Professional Publishing. p. 296. ISBN 0-12-373675-7. ^ a b Katz and Weaver, p. 378. ^ a b Simoons, Frederick J. (1991). Food in China: A Cultural and Historical Inquiry. CRC Press. pp. 147–148. ISBN 0-8493-8804-X. ^ Fulmer, Melinda (19 August 2002). "Lettuce Grows Into A Processed Food". Los Angeles Times. Retrieved 30 June 2012. ^ a b "Lettuce". Agricultural Marketing Resource Center, Iowa State University. May 2015. Retrieved 7 October 2016. ^ Charles, Dan; Aubrey, Allison (12 July 2016). "As Bagged Salad Kits Boom, Americans Eat More Greens". National Public Radio. ^ Hanning, I.B. ; Johnson, M.G. ; Ricke, S.C (December 2008). "Precut prepackaged lettuce: a risk for listeriosis?". Foodborne Pathogens and Disease. 5 (6): 731–746. doi:10.1089/fpd.2008.0142. PMID 18847382. ^ a b "Chapter IV. Outbreaks Associated with Fresh and Fresh-Cut Produce. Incidence, Growth, and Survival of Pathogens in Fresh and Fresh-Cut Produce". Analysis and Evaluation of Preventive Control Measures for the Control and Reduction/Elimination of Microbial Hazards on Fresh and Fresh-Cut Produce. US Food and Drug Administration. 12 April 2012. Archived from the original on 9 November 2012. Retrieved 19 April 2012. ^ Davis, J. G.; Kendall, P. "Preventing E. coli from Garden to Plate". Colorado State University. Retrieved 26 March 2012. ^ Li, Haiping; Tajkarimi, Mehrdad; Osburn, Bennie I (2008). "Impact of Vacuum Cooling on Escherichia coli O157:H7 Infiltration into Lettuce Tissue". Applied and Environmental Microbiology. 74 (10): 3138–42. doi:10.1128/AEM.02811-07. PMC 2394940. PMID 18344328. ^ Gajraj, Roger; Pooransingh, Shalini; Hawker, Jeremy; Olowokure, Babatunde (April 2012). "Multiple outbreaks of Salmonella braenderup associated with consumption of iceberg lettuce". International Journal of Environmental Health Research. 22 (2): 150–155. doi:10.1080/09603123.2011.613114. PMID 21916661. ^ a b c Watts, Donald (2007). Dictionary of Plant Lore. Academic Press. p. 226. ISBN 0-12-374086-X. ^ Duke, James A.; Duke, Peggy-Ann K.; DuCellie, Judith L. (2007). Duke's Handbook of Medicinal Plants of the Bible. CRC Press. p. 232. ISBN 0-8493-8202-5. ^ MacFarquhar, Neil (3 January 2003). "Bashiqa Journal: A Sect Shuns Lettuce and Gives the Devil His Due". The New York Times. Retrieved 23 March 2012. Bradley, Fern Marshall; Ellis, Barbara W.; Martin, Deborah L., eds. (2009). The Organic Gardener's Handbook of Natural Pest and Disease Control. Rodale. ISBN 978-1-60529-677-7. This page was last edited on 28 March 2019, at 13:16 (UTC).